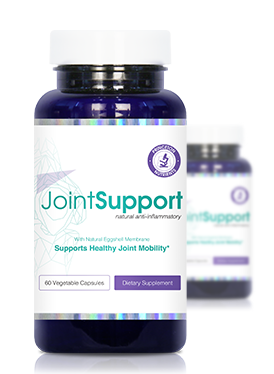 JointSupport delivers the ultimate combination of natural joint-health ingredients including 100% Eggshell Membrane, Turmeric Extract, White Willow, and Boswellia Serrata Extract. 1-866-427-3019 and we'll issue your refund immediately. No-questions asked. The average order for new customers is 3 bottles and that's what we recommend to start. However, because we have many repeat customers, we offer the 6 bottle package so you can take advantage of our best pricing. There is no auto-billing. You order will be processed as a one-time charge. When you're ready to re-order, you can come back to this page, visit our website at PrincetonNutrients.com or call our customer service number. Q: How should I take JointSupport? 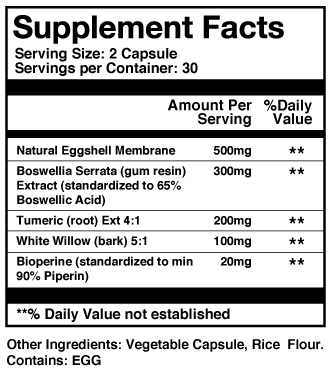 The recommended dosage is 2 capsules daily on an empty stomach. We suggest you make a habit of taking it first thing in the morning, before you eat anything. The capsules are small and easy to swallow. We take your health seriously, which is why we've sourced only the purest and most potent forms of every ingredient that goes into JointSupport. While we cannot guarantee that JointSupport will work for everybody, we receive emails and phone calls everyday from customers who are excited about the results they are feeling. In the unlikely event you are not satisfied – for any reason – you're covered by our 90-day, no-questions-asked, money-back guarantee. When you place an order or access your personal information, everything goes through a secure server. All of your personal information, including credit card number, name, and address, is transmitted via Secure Socket Layer (SSL) technology – the industry standard for secure online transactions. 1. Kevin J Ruff, Dale P DeVore, Michael D Leu, and Mark A Robinson Eggshell membrane: A possible new natural therapeutic for joint and connective tissue disorders. Results from two open-label human clinical studies. Clinical Interventions in Aging. 2009; 4: 235–240.Published online 2009 Jun 9. PMCID: PMC2697588.